The roots of education are bitter but the fruits is sweet. The fundamental purpose of school is learning, not teaching. You educate a man; you educate a man, you educate a woman; you educate a generation. Computer Aided Learning: To enhance the students learning and retention capabilities the school provides comprehensive computer software in different subjects which includes professional voice over, videos and broadcast quality 3D animation. Interactive AV-Learning: The School provides interactive AV-learning in the classroom for the pupils of the Pre-primary, Primary and Secondary section to make learning exciting, interesting and enjoyable. Each classroom is equipped with an interactive whiteboard, a multimedia computer and a projector. Classwise and subjectwise educational content based on the syllabus is mapped to support collaborative learning. Computer Laboratory: The school has a fully equipped airconditioned computer laboratory with unlimited broadband Internet connectivity. Library: To foster and encourage literary taste in its students,the school has a library of over 4500 books and reference books. Science Laboratories: The school has 3 separate, wellequipped Science laboratories for Physics, Chemistry and Biology. 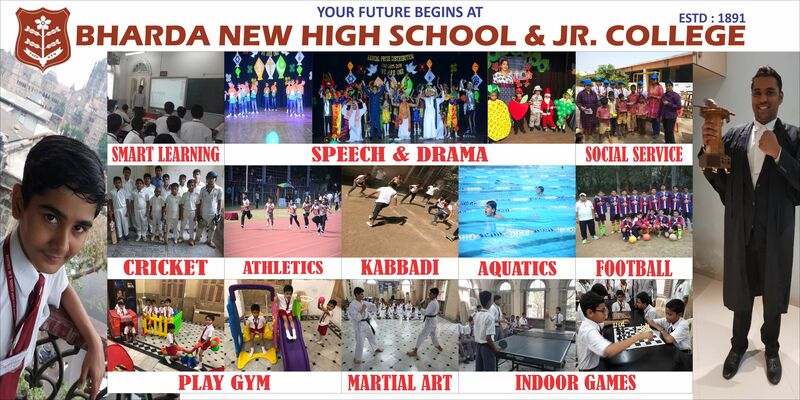 Indoor Games: The school provides indoor games facilities such as badminton, table-tennis, chess and carrom. Outdoor games: The school continues being the ‘Nurseryof Cricket in India’. Our cricket teams take part in inter-school cricket tournaments – The Harris and the Giles Shield Tournaments. The school also provides coaching in swimming at the Y.M.C.A. Swimming Bath. We also hold Athletic and Aquatic Meets annually. Interact Club: The Interact Club was started in 1961. Itundertakes projects in community welfare, vocational service and international understanding. It has secured a number of prizes in the Rotary District for its activities. Social Service Club: The Social Service Club along with theJunior Red Cross undertakes various projects in community service and fosters national and international friendship. It helps in collecting money for the Red Cross Flag Day and various other organisations. Scouting: The School Scout Group was instituted in September. It was renamed the 15th East Bombay Marzban Scout Group after its founder Mr. Kaikobad B. Marzban. The troop regularly participates in various activities of the local and district associations and is managed entirely by the ex-students of the school. Camp craft: This activity was started for the students of themiddle school to prepare the students for the Scout activities and to experience the thrill of camping outdoors. Science and Nature Club: The Science and Nature Clubcarries out nature trails and projects to understand nature and experience its beauty. Excursions and Camps: Excursions and Camps areorganized for students once a year to learn and experience the joy of sharing and caring. The overnight camps are also a platform to showcase hidden talents. Art: A special class is organised for students who have specialtalent for painting and drawing. Students are prepared and sent for the Government Elementary and Intermediate Drawing Grade Examinations. Hindi Rashtra Basha & Marathi Dyanpeeth Examination: Extra classes are conducted to prepare the students for the Hindi Rashtra Basha and Marathi Dyanpeeth examination. Scholarship Examination: Deserving students are preparedfor the scholarship examination in extra classes conducted after school hours. Empathy Award: Awarded to the most empathetic student ofeach class. Best Student Medals: Best students are selected from thepre-primary, primary, middle school, secondary and higher secondary section from the Empathy Award winners. These students are presented with medals on the Annual Prize Distribution Day. Scholastic & Special prizes: Once a year, prizes in scholasticachievements and other prizes are awarded on the Annual Prize Distribution Day. Inhouse Counselling & Workshops: Inhouse counselling isprovided to guide students to face the cut throat competition and challenges as well as choose a suitable career path.Career Fairs and workshops are conducted from time to time to help children gain personal insight. Pre-Primary : 09.00 a.m. - 12.00 noon. Std I to XII : 07.30 a.m. - 01.30 p.m.